The cedar of Lebanon is a true cedar with a distinctive scent and grain. The trees are generally grown in large parks and open spaces for ornamental purposes and their distinctive squat profile, created by the heavy low hanging branches, is easily recognisable. 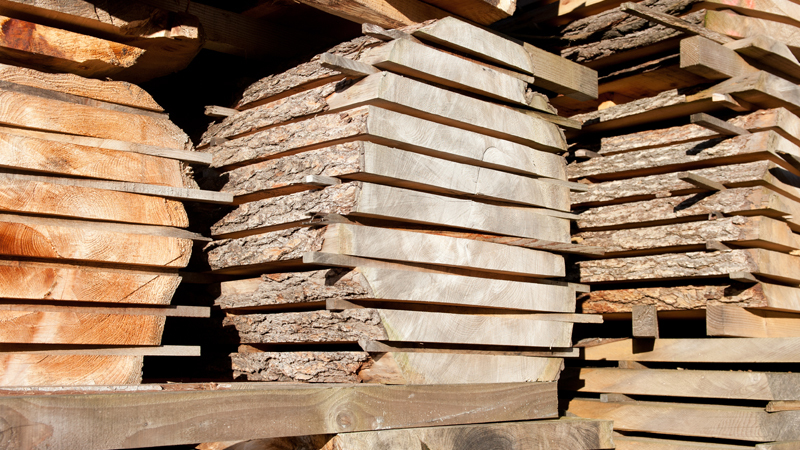 Historically, cedar wood has been used for cabinet making because of its stability and naturally sweet scent. The great width and length of the boards, coupled with the wood’s natural stability, make it ideal for large counter tops or single plank tables. Waney edge boards will be supplied with wane (bark) on one or two edges. These boards are often very wide (up to 700mm) and relatively long. The creamy coloured sap wood of cedar of Lebanon is narrow and can be included in the usable timber. The heart wood is a light rusty-brown colour often punctuated with frequent large knots. The grain is generally straight except around the larger knots. Specification Supplied in waney edge sawn boards. Workability + Works very well. This is our standard joinery grade where sound knots are permitted providing there is a good percentage of clear cutting, yielding lengths of 2.0m+ and widths of 150mm+. The grain will be fairly straight and the colour reasonably consistent. Larger knots and defects will be measured out.Accepted: Some live knots, resin pockets.Not accepted: Rot, excessive worm attack. A cheaper grade suitable for short lengths such as drawer sides. The boards will have frequent large knots that will need to be removed.Accepted: All knots and defects.Not accepted: Rot, excessive worm attack.